Not everywhere rocky like this the shore is mostly sand or clay covered, especially at the South shore. 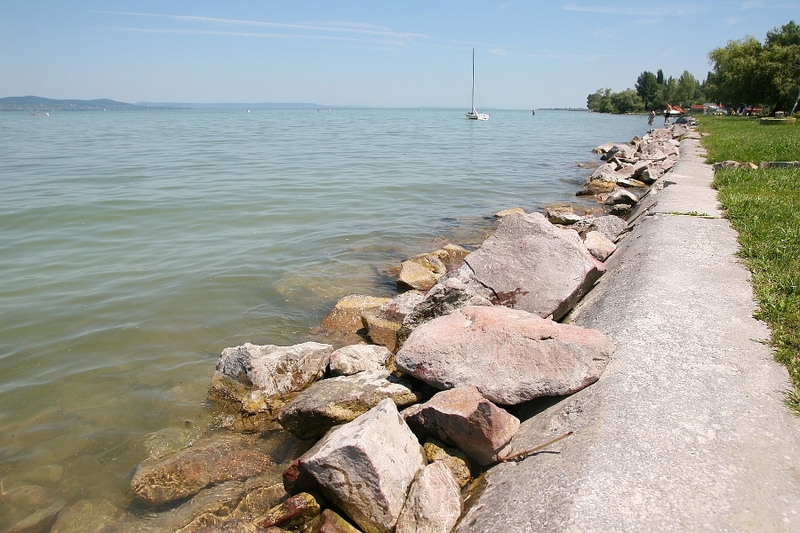 The Lake Balaton is a fantastic place for kids and adults as well. Everything is given here for a good relaxing holiday especially summertime. At the South side of the Lake the water is usually shallower, better for small kids, at the North part of the Lake the water is deeper, better for swimming. The lake is 77 km long and it’s area is approximately 595 km2. The average depth is 3m. The water is clear, and there are many opportunities in the neighborhood as well. Crocodile park, Africa museum, Surf, Concerts, Classical night concerts at Keszthely Festetics Baroque Castle, Puppy museum just to name a few. Zoo at Veszprem. Vulcanic hills with nice wine cellars at North side. Castle ruins at Szigliget, beautiful parks can be found here. Wine houses, and cellars as well. Thousand year old Monastery and vulcanic structures in Tihany. From Budapest all the way on the M7. The smallest distance is around 100-110 km (62 miles). The M7 goes on the South shore. Other non-paying version is the road No7 (it is a free non paying road, not a highway). Covered bicycle road is going all around the lake, it is a popular program to bicycling around the lake, or just partly in several days. Most people come here to have a summer holiday in and around the water. The Main season is July-August. June also can be fine, and sometimes September as well. 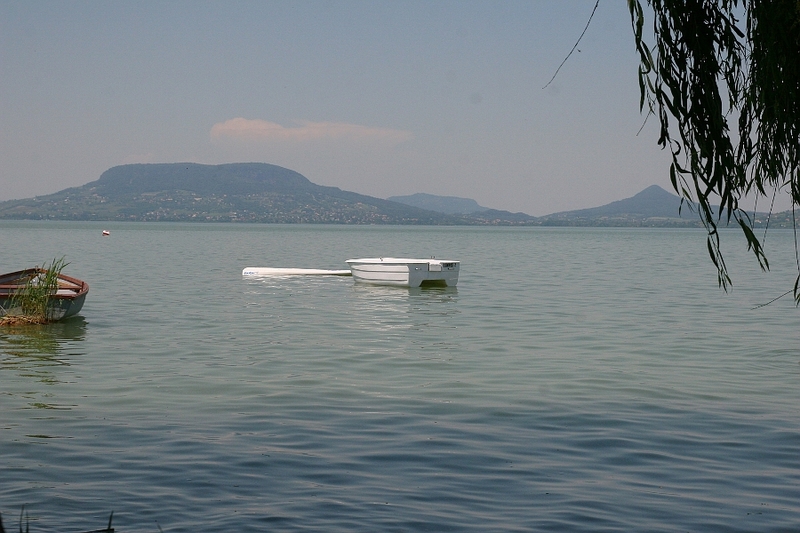 The shallow lake quickly gets warm, around 30 degree Celsius is an ideal temperature. It can be more warm in Hungary, but above 35 degree Celsius is not so common. Beaches: everywhere around the lake most of them free, some of them not. The non free beaches usually has better services such as catering, showers, sunbeds, etc. The most popular destination is Siofok. Most people go here, and live here as well. Despite of this it is a small, mostly resort looking settlement with 20,000 inhabitants. Lots of parties, nightlife, silver and golden beaches, the biggest harbor in the Lake. The other two biggest settlement are Keszthely and Balatonfüred. visit the Festetics Castle, and Helikon museum : 8360 Keszthely, Kastély str 1. Africa museum: 8312 Balatonederics, Kültelek 11. Little Balaton nature reserve visitor center, Kányavári island between Zalavár and Balatonmagyaród the island can be approached through the wooden bridge. Around the island the 1,5-2km road shows the birdlife of the Little balaton reserve. Kányaváry island is freely can be visited without guidance. Harley Davidson festival, Alsőörs 10-14th of Jun 2015.
sound Zamárdi 9-12th of July 2015. There are also many other festivals and events here during the year.